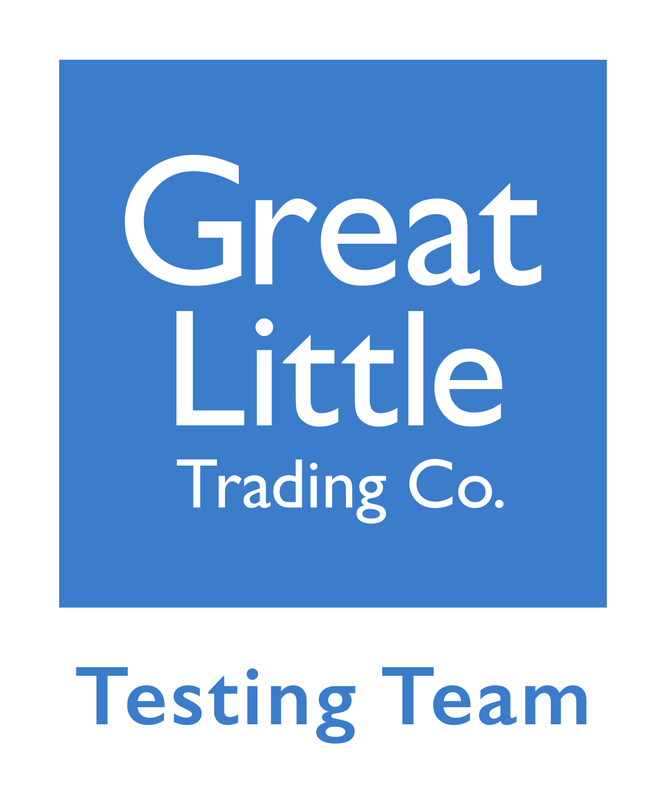 Our first assignment as part of our new role as members of the Great Little Trading Co Testing Team was to review a fantastic item from their huge storage range. 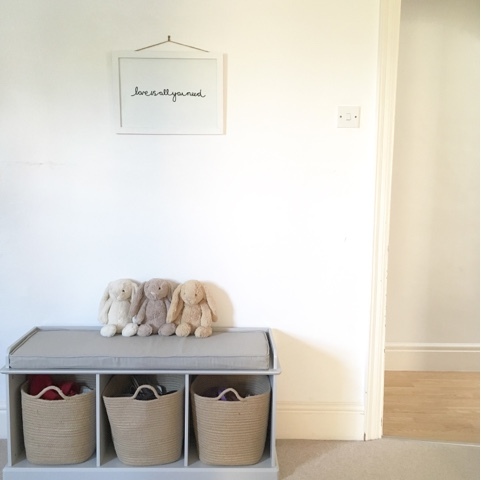 As a family of five, space and storage can be an issue, especially with three young children as they just have so much stuff! 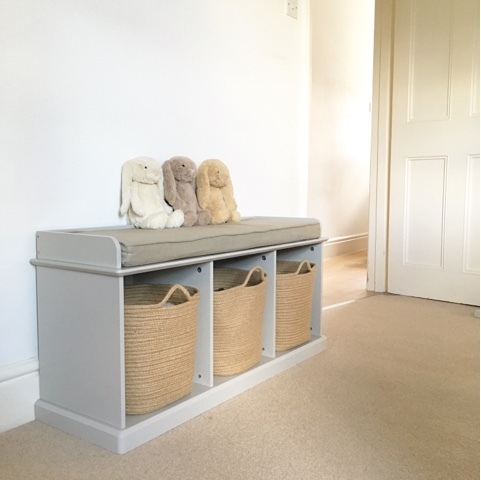 We chose the Abbeville Storage Bench in Stone which offers a practical and stylish solution to everyday life for us with some much needed extra storage. One of the things we have a lot of are shoes - trainers, sandals, party shoes, school shoes and then there are the wellies! Before the Abbeville Storage Bench arrived these usually ended up lining the hallway, or were kept in a pile in the kitchen and under the stairs. 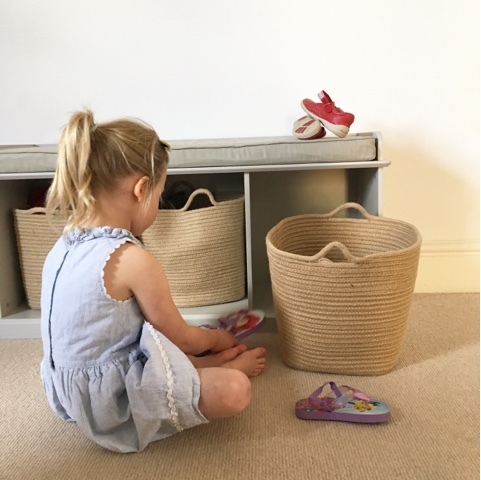 With 3 baskets we have one for the little ladies shoes, one for our shoes and then we've used the last one to pop hats, gloves, scarves and umbrellas in so they are in easy reach. The first thing I noticed about the bench is what high quality it is, it's incredibly sturdy with a lovely finish. I adore the stone colour of the unit itself and the natural seat pad which coordinates really well with the colour scheme of our home. 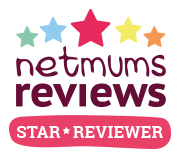 Seat pads are available in the grey star and rainbow star patterns also if you were going to pop the unit in a child's bedroom or playroom.We chose the Natural Coloured Rope Baskets but these also come in Grey and White and co-ordinate so well that you could easily have one of each, or pop in some of the brighter GLTC canvas cube boxes or baskets. The bench also comes in white meaning you can create a bench to suit your tastes and to match or blend in with your room, its completely customisable. The baskets are really spacious and can fit a lot in. 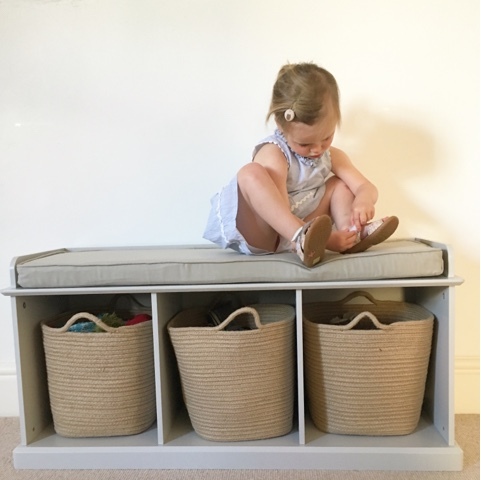 Although we have used them for shoes on this occasion they would also be great in a playroom for quickly tidying away toys into with easy access for little hands. 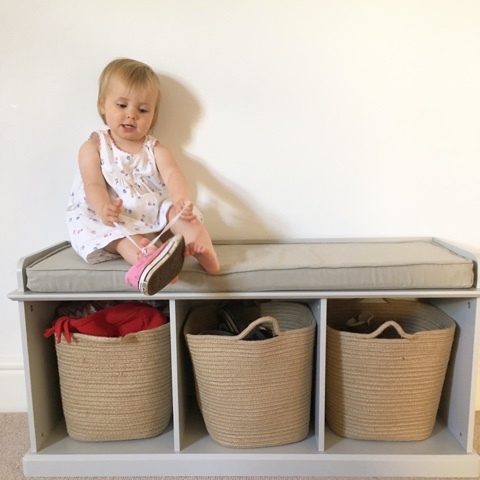 The unit is comfortable for adults and little ones to sit at and is just the right height for children to hop onto. 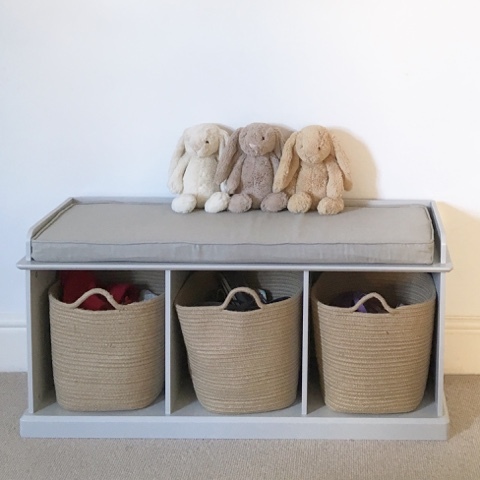 This piece of furniture could literally go in any room in your house and be extremely useful, doubling up as a seat and storage it truly does offer a wonderful family friendly solution. 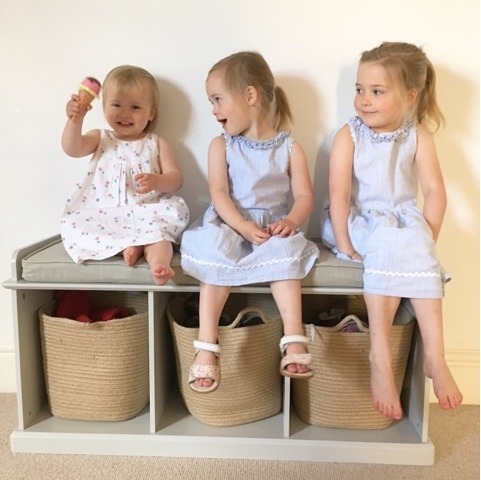 The little ladies love it and have taken to climbing up onto it to put their shoes on which is far better than their previous bottom of the stairs spot where they squabbled for space. The bench is high enough that we could actually pull it up to a table to offer some additional seating when friends or family come over and with a removable, machine washable seat cover it means sticky little hands aren't a problem. I think my favourite thing about this is that the girls can get their own things out the baskets and help put them away easily, teaching a little bit of independence and teamwork as well as helping me out a bit! The wonderful thing is that they have been so keen to do just that making it a piece of furniture that works for the entire family. As they get older and their shoes get bigger I expect they will end up claiming a basket each! Their favourite bit by far is that they can all sit on it together and they have each independently hopped up onto it to play or to look at a book. 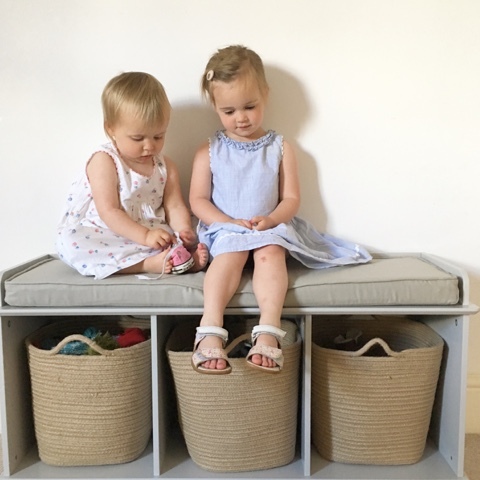 The Abbeville Storage Bench gets top marks from us for being as versatile as it is stylish.